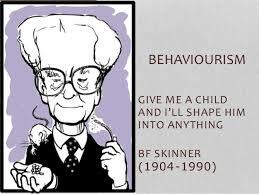 Today is the birthday (1904) of Burrhus Frederic “B.F.” Skinner noted for his take on behaviorism in psychology. Skinner considered free will an illusion and human action dependent on consequences of previous actions. Skinner believed that living things behaved according to certain basic principles which could be defined and measured. 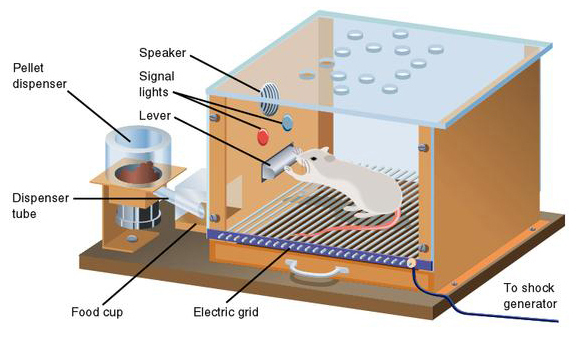 For one of his key parameters, operant conditioning, he invented the operant conditioning chamber, also known as the Skinner Box. Skinner founded a school of experimental research psychology and imagined the application of his ideas in the design of a human community in his utopian novel, Walden Two. Skinner was born in Susquehanna, Pennsylvania, to Grace and William Skinner. His father was a lawyer. He attended Hamilton College in New York with the intention of becoming a writer. After receiving his Bachelor of Arts in English literature in 1926, he attended Harvard University. A fellow student, Fred Keller, convinced Skinner that he could make an experimental science from the study of behavior. This led Skinner to invent his prototype for the Skinner Box and to join Keller in the creation of other tools for small experiments. After graduation, he unsuccessfully tried to write a novel while he lived with his parents, a period that he later called the Dark Years. He became disillusioned with his literary skills despite encouragement from Robert Frost, concluding that he had little world experience and no strong personal perspective from which to write. 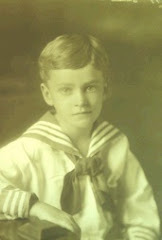 His encounter with John B. Watson’s Behaviorism led him into graduate study in psychology and to the development of his own version of behaviorism. 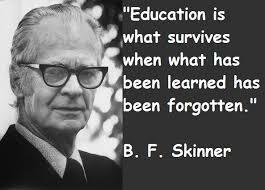 Skinner received a PhD from Harvard in 1931 and remained there as a researcher until 1936. He then taught at the University of Minnesota at Minneapolis and later at Indiana University, where he was chair of the psychology department from 1946–1947, before returning to Harvard as a tenured professor in 1948. The position can be stated as follows: what is felt or introspectively observed is not some nonphysical world of consciousness, mind, or mental life but the observer’s own body. This does not mean, as I shall show later, that introspection is a kind of psychological research, nor does it mean (and this is the heart of the argument) that what are felt or introspectively observed are the causes of the behavior. An organism behaves as it does because of its current structure, but most of this is out of reach of introspection. At the moment we must content ourselves, as the methodological behaviorist insists, with a person’s genetic and environment histories. What are introspectively observed are certain collateral products of those histories. Skinner’s behavioral theory was largely set forth in his first book, Behavior of Organisms. Here he gave a systematic description of the manner in which environmental variables control behavior. He distinguished two sorts of behavior—respondent and operant—which are controlled in different ways. Respondent behaviors are elicited by stimuli, and may be modified through respondent conditioning, which is often called “Pavlovian conditioning” or “classical conditioning”, in which a neutral stimulus is paired with an eliciting stimulus. Operant behaviors, in contrast, are “emitted”, meaning that initially they are not induced by any particular stimulus. They are strengthened through operant conditioning, sometimes called “instrumental conditioning”, in which the occurrence of a response yields a reinforcer. Respondent behaviors might be measured by their latency or strength, operant behaviors by their rate. Both of these sorts of behavior had already been studied experimentally, for example, respondents by Pavlov, and operants by Thorndike. Skinner’s account differed in some ways from these earlier ones, and was one of the first accounts to bring them under one umbrella. The idea that behavior is strengthened or weakened by its consequences raises several questions. Among the most important are: (1) Operant responses are strengthened by reinforcement, but where do they come from in the first place? (2) Once it is in the organism’s repertoire, how is a response directed or controlled? (3) How can very complex and seemingly novel behaviors be explained? Skinner’s answer to the first question was very much like Darwin’s answer to the question of the origin of a new bodily structure, namely, variation and selection. Similarly, the behavior of an individual varies from moment to moment; a variation that is followed by reinforcement is strengthened and becomes prominent in that individual’s behavioral repertoire. “Shaping” was Skinner’s term for the gradual modification of behavior by the reinforcement of desired variations. Skinner believed that “superstitious” behavior can arise when a response happens to be followed by reinforcement to which it is actually unrelated. Skinner answered the second question by saying that a stimulus comes to control an operant if it is present when the response is reinforced and absent when it is not. For example, if lever-pressing brings food only when a light is on, a rat, or a child, will learn to press the lever only when the light is on. Skinner summarized this relationship by saying that a discriminative stimulus (e.g. light) sets the occasion for the reinforcement (food) of the operant (lever-press). This three-term contingency (stimulus-response-reinforcer) is one of Skinner’s most important concepts, and sets his theory apart from theories that use only pair-wise associations. Most behavior of humans cannot easily be described in terms of individual responses reinforced one by one, and Skinner devoted a great deal of effort to the problem of behavioral complexity. Some complex behavior can be seen as a sequence of relatively simple responses, and here Skinner invoked the idea of “chaining.” Chaining is based on the fact, experimentally demonstrated, that a discriminative stimulus not only sets the occasion for subsequent behavior, but it can also reinforce a behavior that precedes it. That is, a discriminative stimulus is also a “conditioned reinforcer.” For example, the light that sets the occasion for lever pressing may also be used to reinforce “turning around” in the presence of a noise. This results in the sequence “noise – turn-around – light – press lever – food.” Much longer chains can be built by adding more stimuli and responses. However, Skinner recognized that a great deal of behavior, especially human behavior, cannot be accounted for by gradual shaping or the construction of response sequences. Complex behavior often appears suddenly in its final form. To account for such behavior, Skinner introduced the concept of rule-governed behavior. First, relatively simple behaviors come under the control of verbal stimuli: the child learns to “jump”, “open the book”, and so on. After a large number of responses come under such verbal control, a sequence of verbal stimuli can evoke an almost unlimited variety of complex responses. Reinforcement, a key concept of behaviorism, is the primary process that shapes and controls behavior, and occurs in two ways, “positive” and “negative.” In The Behavior of Organisms (1938), Skinner defined “negative reinforcement” to be synonymous with punishment, that is, the presentation of an aversive stimulus. Subsequently, in Science and Human Behavior (1953), Skinner redefined negative reinforcement. In what has now become the standard set of definitions, positive reinforcement is the strengthening of behavior by the occurrence of some event (e.g., praise after some behavior is performed), whereas negative reinforcement is the strengthening of behavior by the removal or avoidance of some aversive event (e.g., opening and raising an umbrella over your head on a rainy day is reinforced by the cessation of rain falling on you). Both types of reinforcement strengthen behavior or increase the probability of a behavior reoccurring; the difference is in whether the reinforcing event is something applied (positive reinforcement) or something removed or avoided (negative reinforcement). Punishment is the application of an aversive stimulus/event (positive punishment or punishment by contingent stimulation) or the removal of a desirable stimulus (negative punishment or punishment by contingent withdrawal). 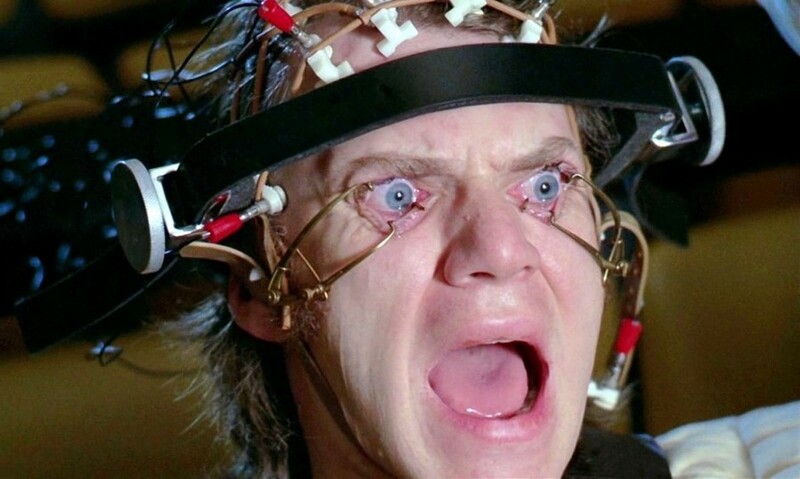 Anthony Burgess’ A Clockwork Orange is a fictionalized critique of Skinner’s behaviorism, which hits home in part. There is a whole lot to more to behavior than conditioning. Skinner was fond of making contraptions as a boy, which may be why he hit on the Skinner box as an adult. When he was growing up, he and a friend built a cabin in the woods where elderberry trees were plentiful. They made some money from a door to door business selling elderberries, but had a problem harvesting the berries because green berries mixed in with the ripe ones when they were picked. So, he designed a flotation system to separate ripe from green berries. My house in the Catskills was not so far from the area where Skinner was a boy, and I had elderberries growing wild on the edge of my wood lot. I used them primarily with apples in apple crumble, but they have a range of uses. They are a little too tart and juicy to be used by themselves in pies and such, but their flavor is excellent when mixed with apples or pears. They can also be folded into bread dough to make something similar to raisin bread. Basically, wherever you use currants or raisins, you can use elderberries. 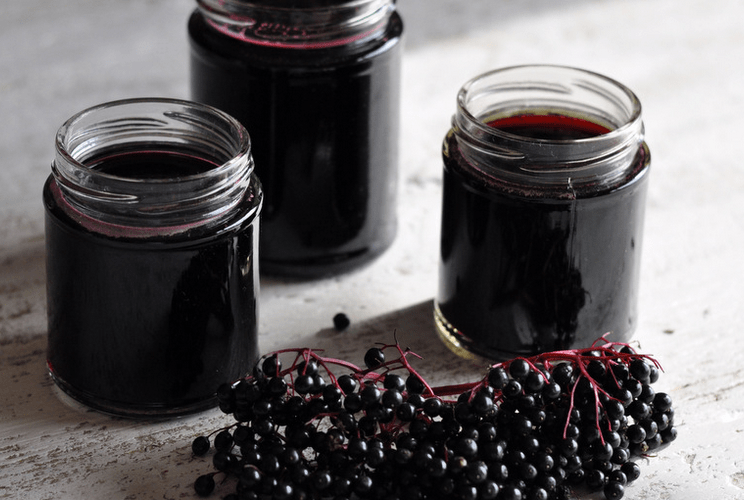 Elderberries are also commonly used to make syrup which is sometimes used as a cough medicine, but can also be used on pancakes. This is the simplest recipe for a basic syrup. Place the elderberries and water in a medium saucepan, bring to a boil, reduce the heat, and simmer on medium-low for 30 minutes. Reduce the liquid by about one-third. Remove pan from the heat and mash the elderberries. Strain the mixture into a bowl using 2 layers of cheesecloth. Let the liquid cool to barely warm, gently stir in the honey, and mix thoroughly. 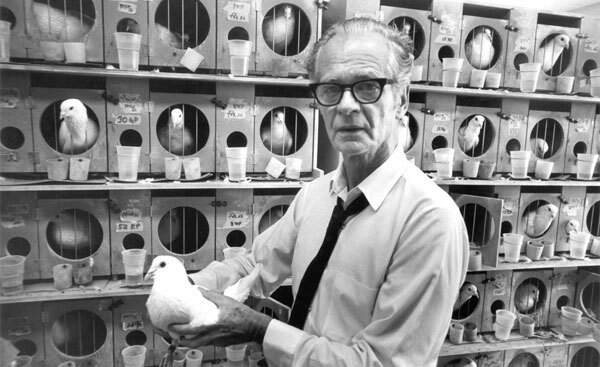 Hi, may I reproduce your top photo of B.F. Skinner in my upcoming book on habit change? I do not hold the copyright for the photo. Generally, the images I use on my blog are in the public domain, and I am not using my blog to make money; therefore I am relying on “fair use” rules. For a book you will need to be more circumspect.